The rise and rise of bills 2: why is it so hard to understand electricity costs? In my last post I wrote about the increasing cost of environmental policies on the back of prices rises from npower and a capacity auction that will secure capacity for next winter at over three times the price of the scheme it replaced. Since then Scottish Power has joined npower and EDF in announcing price rises, and the Labour Party is again promising to impose price caps on electricity if it comes to power. 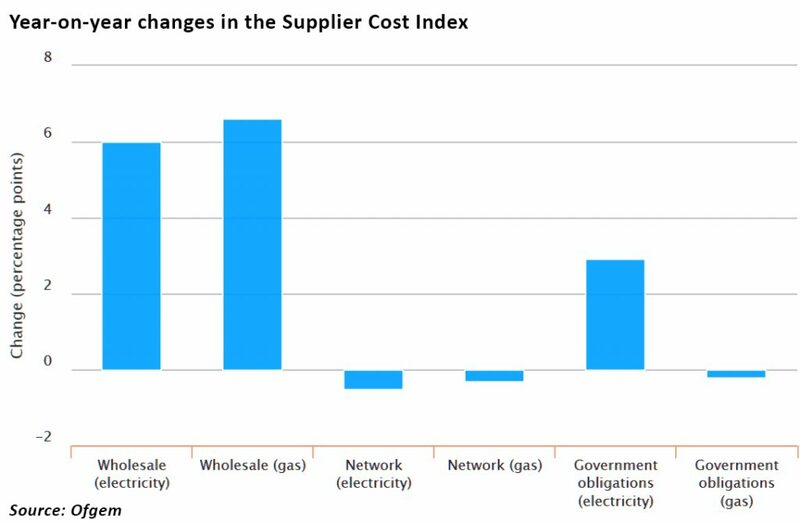 I argued in my post that increasing wholesale prices meant that rises in costs due to energy policy could no longer be disguised…in recent years falling wholesale prices have offset these additional costs meaning that suppliers have been able to avoid passing price rises on to consumers. Now that wholesale prices are again rising, suppliers are now in turn increasing bills for end users, creating the inevitable outcry. 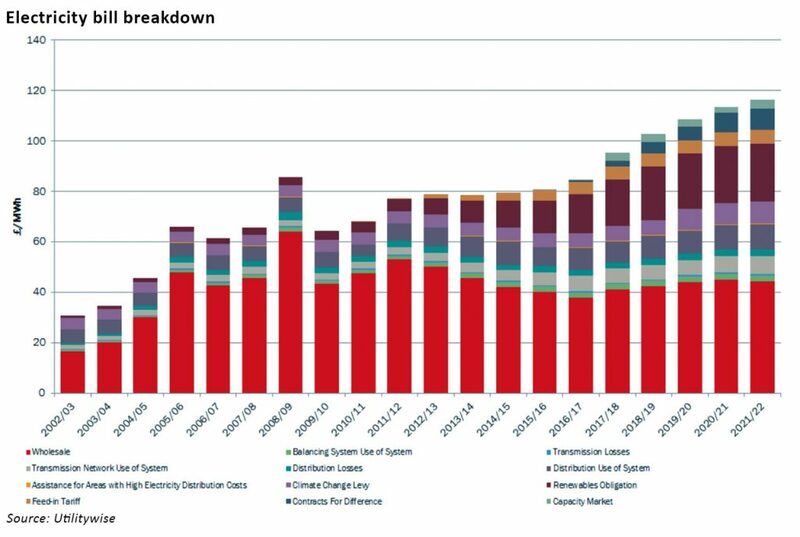 I presented data from Ofgem and Utilitywise illustrating the composition of bills and how the non-commodity component was growing and set to grow further. One of my readers identified a discrepancy between the two data sources which I have been trying to understand…part of the difference is due to the Utilitywise figures excluding supplier operating costs, margin and VAT, but even so the two data sets are not consistent with each other. So I started trying to find data that would allow me to reconcile the two and soon realised that this is an extremely difficult thing to do, since the underlying data is all over the place, and provided in a variety of different units. I tried to find independent, verifiable sources and got no-where, so while the Utilitywise chart is interesting in that it illustrates their modelling of cost trends, it’s difficult to comment on the reasonableness of the forecasts without understanding their construction. No doubt if I was willing to spend a few days digging into it I could pull something together, but that isn’t my purpose in writing this blog. The Consolidated Segmented Statements provided by the energy companies are completed according to Ofgem guidelines and are audited. They also provide a reconciliation with the supplier’s accounting profits. However, they are insufficiently granular to allow for meaningful analysis, similarly for the new Supplier Cost Index for which Ofgem publishes the methodology but not the underlying data. Interestingly, I also took a look at Ofgem’s data on Day Ahead electricity prices and found the average price in 2015 was £40.75 /MWh. The CSS data includes wholesale energy cost, losses, the energy element of RBD costs, balancing and shaping costs in direct fuel costs….the average fuel cost of £56.15 /MWh suggests that losses, balancing costs etc were about £15 /MWh which seems a lot. BEIS and Ofgem between them need to get a grip on the situation. Consumer trust is at low levels but instead of publishing detailed, transparent information, Ofgem continues to provide data that is so aggregated that it is impossible to unpick exactly where price rises are originating. The CSS data does not support the accusations of profiteering being levelled at the industry, but until all elements of the costs are broken out in a transparent and easy to view way, the debate will struggle to move forward from the current finger-pointing. Clearly British Gas is hoping to benefit from this in the near term, but the underlying economics cannot be ignored…if the costs of environmental and social policies are rising at the same time that wholesale prices are growing, there will be a point at which efficiency savings will not be enough to avoid increasing bills to customers. To repeat my previous conclusion…it really is time to come clean about the rising cost of electricity.